Plumber Napa, CA | A+ Waterworks, Inc.
No matter how sturdy you think your plumbing system is, you’ll eventually encounter clogged drains or leaky pipes. At times like this, a plumber in Napa, CA can help. While you can try fixing your home plumbing problems, the task is best left to professional plumbers in Napa, California. A+ Waterworks specializes in plumbing, fire system, and sanitation services. If you need help with installing or repairing your plumbing system, our plumbers in Napa, California are the person to call. Your plumbing system is an integral part of your home and lifestyle, which is why you have to keep it in tip-top shape. Plumbers in Napa, CA can do that on your behalf. Listed below are situations that call for the service of plumbers in Napa, California. Hire a plumber in Napa, CA when you experience constant leaks and reduced flow. Have you been experiencing constant dripping from your faucet? Maybe you’ve noticed a plumbing fixture has stopped delivering with its usual pressure. Among others, these are signs that your plumbing system needs fixing. You can consider replacing a pipe or two, but that doesn’t guarantee the problem won’t recur after a time. For long-term results, consider hiring plumbers in Napa, California. 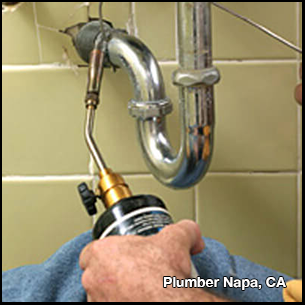 Our licensed plumbers in Napa, CA are experienced in the installation, maintenance, and repair of plumbing systems. If you’re looking for reliable plumbing service, our plumbers in Napa, CA is are for the job. Hire a plumber in Napa, CA when you’re faced with recurring clogs. If your toilet, sink, or other plumbing fixtures keep getting clogged, consider calling plumbers in Napa, CA for help. No matter how much effort you put into removing stuck particles in your drain, this will keep happening if you don’t get to the root of the problem. Plumbers in Napa, CA can do that for you. By inspecting and doing the necessary repair to your system, plumbers in Napa, CA can protect it from further damage. Hire a plumber in Napa, California when you have multiple clogged drains. A clogged drain may be fixed with a few adjustments. However, if a lot of your plumbing fixtures are clogged, it’s time to work with a plumber in Napa, CA. Multiple clogged drains are typically caused by a pipe blockage in your draining system. When this happens, using drain plungers or cleaners is not enough. You’ll need the supervision of a plumber in Napa, CA. At A+ Waterworks, we provide residential and commercial clients with an unparalleled level of dedication and skill. If you hire our plumbers in Napa, California to work on your plumbing system, expect optimal and long-lasting results. Hire a plumber in Napa, CA when your water heater is not functioning properly. Unlike dripping faucets, leaking water heaters are harder to notice. Some only begin to realize this until there’s an unexplainable increase in their electricity and water bills. Water heater malfunction can stem from different issues, one of which is a plumbing problem. When this happens, the knowledge and expertise of plumbers in Napa, CA comes in handy to help with an emergency fix. If left unattended, a defective water heater can do extensive damage to your property. To prevent this, consider hiring our plumbers in Napa, CA. Every A+ Waterworks plumbers in Napa, CA are trained to make sure emergency plumbing systems are in excellent, working condition. Hire a plumber in Napa, CA when you need to perform major installations. Whether you need help with a leaky pipe, clogged drain, or malfunctioning plumbing fixture, you can rely on our licensed plumber in Napa, CA. Contact us today for a consultation. Our service are available to clients 24 hours a day, seven days a week. Whether it’s a small leak in your sink at 2 in the morning, or a total overhaul of your plumbing system at a scheduled time, A+ Waterworks is ready to give you A+ service! We specialize in a variety of residential and commercial plumbing service, and never sacrifice quality for quantity. From fixing minor leaks in houses to maintaining the plumbing system of an industrial warehouse facility, our plumbers will allot the same amount of care and attention to every project we do. A+ Waterworks looks forward to creating long-term relationships with every client by ensuring customer satisfaction with every plumbing order. A+ Waterworks has licensed sprinkler fitters who have years of industry experience. Our team has installed fire sprinklers for warehouse facilities, multifamily housings, hotels, office buildings, and small residences. The installation and repair services we offer are available at reasonable rates. The A+ Waterworks team has decades of industry experience in the residential and commercial area sewer cleaning. Our sanitation experts will do everything to determine the cause of the blockages. From there, we’ll use the information we get to plan and implement actions that prevent these blocks from happening again.